Hey guys! I’m back in New Orleans, but I there are some more thoughts I want to share about my recent road trip. On the way back from South Carolina my boyfriend and I stopped stopped in Atlanta to eat lunch with a friend at Hankook Taqueria (and pick up Publix subs for the road). 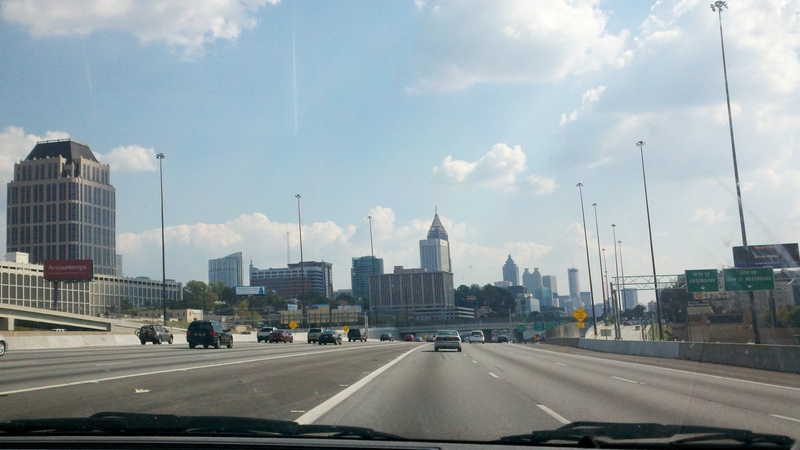 I am quite fond of Atlanta. I have been many times and have a number of friends who live there. My boyfriend is from Sacramento and hasn’t traveled as much through the South as I have. 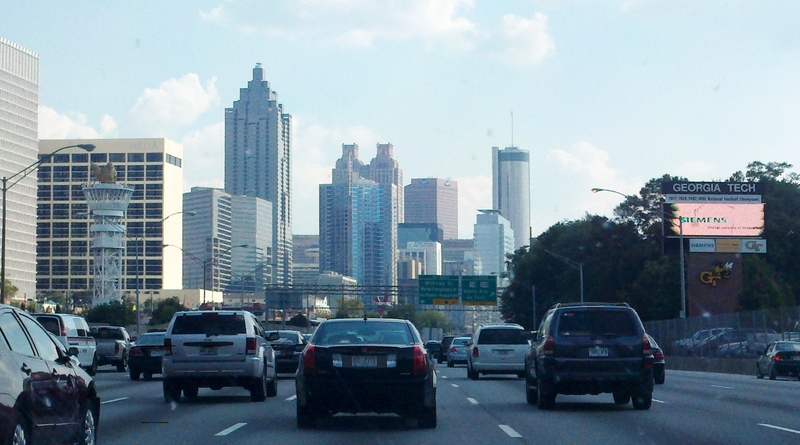 He remarked that he didn’t see the difference between Atlanta and any of the sprawling cities we’ve driven through on this road trip and others. I realize that Atlanta has a lot of metropolitan aspects that I really don’t like including traffic, suburban sprawl, chain stores and big, glass buildings that don’t make leave an aesthetic memory. Yet, as we wove through the city on Hwy 85, I snapped pictures of the tall buildings that hugged the roads and thought about the impressive expanse of the city. To me, Atlanta represents a compromise between the bustling, unique cities I’ve always liked and enjoyed living in, and the familiarity of recognizable brand names and new building comforts that remind of growing up in Miami and going to college in Gainesville. There’s a lot of creative spirit in the city. Atlanta is home to a number of graphic design schools (The Portfolio Center and Creative Circus come to mind) as well as the Cartoon Network. There is a great music scene and lots of independent shops. The city’s older neighborhoods are beautiful and the commercial areas are diverse and interesting–some are transitioning/gentrifying, while others are yuppy and well manicured. And although you do need a car to get most places, you have the option of MARTA to get to the airport. Anyone who has read this blog knows I hate to admit how much I enjoy chain stores. But I do. And one advantage that Atlanta has even over my beloved West Bank, is PUBLIX. Publix grocery stores started in Florida, but have spread throughout the South… except to New Orleans. The stores are clean, reasonably priced, homey and make the best subs. They also have amazing packaging. Atlanta also reminds me a lot of Gainesville, where I went to college. (It helps that there are a lot of Gator Alum in the city.) Like that college town, there are hundreds of apartment complexes, and although they are new and many don’t seethe of personality, they are new. They have pools, fresh carpets, big bathrooms and normal plumbing. I loved my DC apartment, with its built-in bookshelves and curved ceilings, but I had ongoing sewage problems for six months. I like the wood floors and raised porch of my house in Mid City, but you all really know I just want a closet. What do you guys think of Atlanta? Would you ever live there?